18 km south-east of Bollene by the D8. 20 km north-east of Orange by the D975 and then the D8. 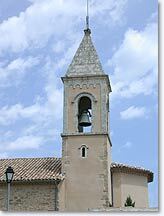 The charming village of Cairanne is located in upper Vaucluse, a stone's throw away from the "Enclave des Papes" area and close to the border of the Drome departement. 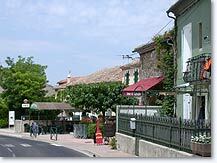 Cairanne is blessed with fertile land and a climate that is particularly suited to wine-growing. The village is surrounded by fabulous Cotes du Rhone vineyards and you will be able to sample very good wine here, renowned far beyond the confines of the area. If you wish to learn more about wine and wine growing, a waymarked trail will enable you to discover the vineyards of Cairanne where each of the grape varieties is labelled for easy identification. Strolling through the narrow streets in the western part of Cairanne you'll go past the mairie, small squares surrounded by beautiful village houses. 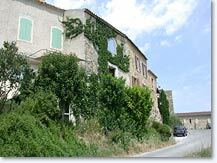 On the east side of Cairanne, you will marvel as you discover the old village. 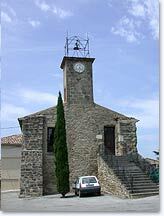 A steep stairway will lead you up to the Dungeon, then on to the St Roch chapel (1726) located next to the Autanne Gate. From there you will be able to walk along the path of the ramparts (1123), which surrounds the old village for a few metres and enjoy superb views of the Ventoux and Saint-Andeol hill. On this path round the battlements you will see two round towers and a square one called "the Templars' Tower". 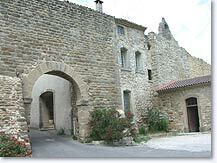 Cairanne tourist office provides carefully prepared tours enabling you to discover the old village and also some short walking tours around the village. Whatever your wishes or your physical form, you will be able to pick your walk. There are 4 possible circuits available, ranging from 40 minutes to 2 and a half hours of walking. Those who feel more courageous will be able to follow ther in GR4 national hiking footpath quwhich goes through the village. This will eventually lead them right up to the Dentelles de Montmirail situated 30 km east of Cairanne or going towards the west they will be able to leave the Provence region and cross into the Ardeche department. Chemin de Ronde de St Roch (path round the battlements). Templars' Tower. Chapel of Notre Dame des Exes (1631). Wine festival on the 4th Sunday in July. April : presentation of the year's vintage to be enjoyed withbraised lamb. Rasteau (6km), Ste Cecile Les Vignes (5km), Tulette (9km), Camaret sur Aigues (11 km).